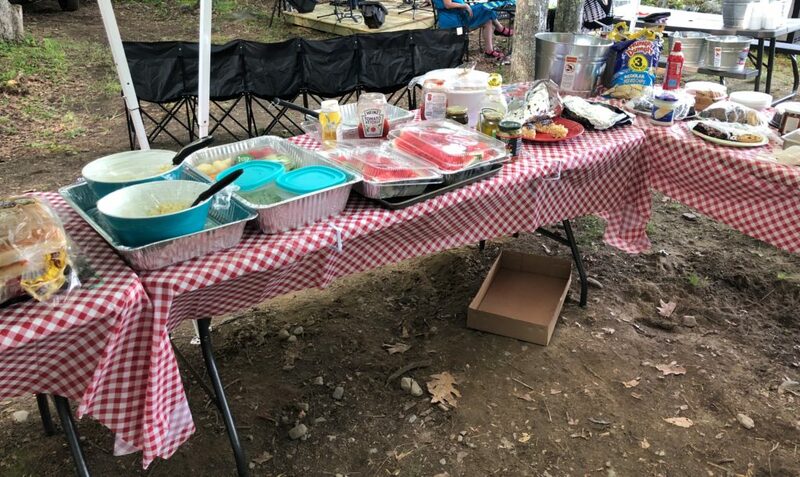 Summer cookouts can make it difficult to eat for your goals… but the reality is…it doesn’t have to be difficult. If you are looking to lose weight, yes, it’s important to eat nutritious food, but at the end of the day, portion size is what is most important. Very often, people tell me they eat “healthy, non-processed foods” most of time, and don’t know why they aren’t losing weight. It’s because the portions of those healthy foods are too large. Here is a guideline you can use to see if your portions are right at a cookout! Knowing this, take into consideration what you’ve already eaten in the day, and how much more you plan on eating around your social events. Then, break down your foods into hand portions. One of my favorite go-to’s at summer carnivals is hand-cut fries. A little vinegar on these puppies and I am in heaven! Here is an example of 3 cupped hands of carbs. It would almost appear as 2 cupped hands of carbs, but the picture doesn’t show how deep this bowl of fries is! When I eat this, I know how many total handfuls of carbs I have for the day, and just tally off those carbs from my remaining carbs. It’s that simple! 2. Don’t Restrict Yourself from the Good Stuff! If there is an awesome desert you look forward to having, have it! If you don’t, you’re going to crave it now and binge on it later anyways! Remember, portions is more important than quality when it comes to weight loss (or weight gain)! Just drink some water! If you aren’t a plain water person, pre-pack some flavored sparkling water and poor it into your wine glass or solo cup at the party! Hopefully these three tips give you some more clarity on how to navigate cookouts! Its not always easy, but you feel really great after… and the more you practice these habits, the easier it becomes! Hope you have a great Thursday, enjoy your day! P.S. Our Summer Couch to 5k Program has 5 spots left… If you want to run your first 5k or just want to get moving during the warm weather, check this out! It starts this upcoming Tuesday! Learn more by clicking HERE!